What is included in the REST package? The REST pack comprises a hard copy folder plus a USB memory stick, containing everything in the folder plus interactive and editable versions of all the training, recording, tracking materials, etc. The REST programme includes: the Resilience Scale itself, a scale for pupils to self-assess, methods for moderating and tracking findings, training PowerPoint presentations for teachers, a section on working with parents (including a presentation, Top Tips handout, and invitation letter template), interventions for teachers to use against the descriptors on the Scale, a 6-activity programme for building resilience, assemblies for 4-7 year olds and 7-11/12 year olds and Jigsaw PSHE sample lesson plans (3 for each year group) that can be used to build resilience related to the descriptors on the Scale. Do I need more than one REST package for my school? You only need one pack. When you buy the REST resource you can use it for all the pupils in your school, this includes older primary pupils who you may want to involve in self-assessing using the Pupils’ Scale. Does REST give us ideas as to how to actually build resilience once we have assessed where children are on the Scale? REST is full of ideas and methods for building resilience and engagement. There are interventions for teachers to use with each year group directly linked to the descriptors on the Scale, assemblies for KS1 and KS2, a 6-activity intervention programme for boosting resilience, which can be used in conjunction with pupils’ self-assessing and Jigsaw PSHE activities linked directly to the descriptors themselves. Importantly it also gets teachers thinking about how they are role-modelling resilience to the pupils and the effect that can have. How does REST contribute to children's well-being and mental health? Using the Scale initially really increases teachers’ understanding of how resilient and engaged their pupils are. This increased understanding and ‘culture of resilience’, combined with the many methods for improving pupil’s resilience and engagement contained in the resource, aids teachers in pro-actively improving children’s well-being and mental health. Combined with other indicators, it can also assist teachers/schools in recognising that a child needs professional intervention. How does REST help with Ofsted? Using the resource allows schools to demonstrate evidence for many aspects of Ofsted’s framework for school inspection (England). In particular, it can help with evidence towards Personal Development, Behaviour and Welfare. Pupils understand how their education equips them with the behaviours and attitudes necessary for success in their next stage of education, training or employment and their adult life. Pupils can explain accurately and confidently how to keep themselves healthy. They make informed choices about healthy eating, fitness and their emotional and mental well-being. The schools open culture actively promotes all aspects of pupils’ welfare. How does REST work alongside Jigsaw, the mindful approach to PSHE? REST is designed for assessing pupils’ resilience and engagement and then working on ideas to build it. It works alongside Jigsaw PSHE as it can actually help to demonstrate the difference you, as a school, are making to your pupils’ well-being. Using Jigsaw PSHE underpins the assessment and work from REST through a universal PSHE curriculum and mindfulness practice. 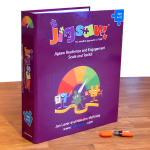 Activities from the Jigsaw PSHE materials are used as targeted interventions forming a symbiotic relationship between REST and Jigsaw PSHE. Will this add extra time to what teachers have to assess and their hectic schedules? The Scale itself is simple to use and teachers can assess pupils easily in just a few minutes. The initial introduction needs a little time set aside (a staff meeting for example) though it is an essential part of the process for teachers to initially reflect and build understanding, a PowerPoint presentation is included as part of the resource to take schools through this process. Is there a risk that pupils may feel down about if their Resilience Score is low? Younger pupils up to the age of 9-10 don’t need to be aware of the Scale or their score. It will certainly help if they realise that resilience is an important trait and something the school are trying to build in them, though an awareness of their score in that regard is unnecessary. Older pupils (9/10+) can self-assess, though this is their own score and again they don’t need to be aware of how the teacher has scored them. Pupils who do feel down about their score or their resilience generally are hopefully those that teachers can help the most. Can REST be run as an intervention, led by a teaching assistant, or does it have to be a whole class approach? REST can be effectively be run as an intervention by a TA after using the Scale to identify which children would benefit. The TA could use the methods outlined against the descriptors in the Scale to build a group of pupils’ resilience. On top of that, there is a 6-activity programme that can be used with small groups of pupils to build resilience, and depending on the age of the pupils they could also self-assess (works best with 9/10+). All of this is detailed in the resource. Yes, the REST Programme has a section specifically to support schools to involve parents in the resilience-building process. A PowerPoint presentation, handout of Top Tips, together with an invitation letter template are included to help schools facilitate Parent Information sessions.